On September 28, 1542, Juan Rodríguez Cabrillo landed at San Diego Bay. This event marked the first time that a European expedition had set foot on what later became the west coast of the United States. 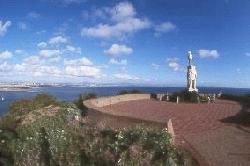 His accomplishments were memorialized on October 14, 1913 with the establishment of Cabrillo National Monument. The park offers a superb view of San Diego’s harbor and skyline. At the highest point of the park stands the Old Point Loma Lighthouse, which has been a San Diego icon since 1854. A statue and museum in the Visitor Center commemorate Juan Rodríguez Cabrillo"s exploration of the coast of California. In a former army building an exhibit tells the story of the coast artillery on Point Loma. In the winter, migrating gray whales can be seen off the coast. Native coastal sage scrub habitat along the Bayside Trail offers a quiet place to reflect and relax. On the west side of the park is a small but beautiful stretch of rocky-intertidal coastline. Details Golden Age,Golden Access, and National Parks Pass passports and Cabrillo National Monument annual pass are accepted in lieu of the fee. Tour bus fees vary, depending on bus capacity - contact the park for information: (619) 557-5450. Details The Cabrillo Park Pass is $15.00 and gives you unlimited entrance to Cabrillo National Monument for one year from the date of purchase. An extra benefit: 80% of the cost of your pass is returned to Cabrillo National Monument to support park operations and enhance visitor facilities and services. Hours of Operation: Daily: 9:00 a.m. to 5:15 p.m. Open until 6:15 p.m. during the summer, July 4 through Labor Day. Winter and spring are especially good times to visit the park. The annual migration of gray whales occurs December through February. November through March is generally the best time to explore the park’s rocky intertidal (tidepool) area. The coastal sage scrub is usually at peak bloom between February through April. Air visibility tends to be clearest in the winter, and visitors to Cabrillo National Monument often discover spectacular views of San Diego Bay and downtown, Mexico, and the surrounding ocean during this time.